For former St. Cloud State forward Ryan Poehling, goals have been easier to come by in the NHL than they were in college. 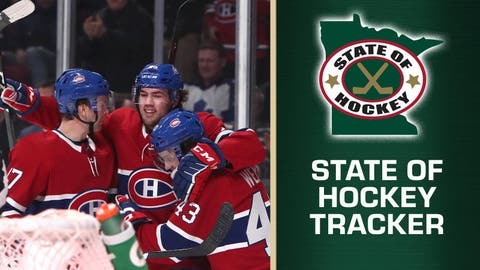 Poehling, 20, made his NHL debut Saturday, a week after forgoing his senior season with the Huskies, where he was immediately inserted into one of the league’s most storied rivalries. He did it all, scoring three goals in regulation, then registering the shootout-winning goal to lead the Montreal Canadiens to a 6-5 win over the rival Toronto Maple Leafs. A point-per-game player during his sophomore and junior seasons at St. Cloud State, Poehling’s skills have never been in question, but his dominant debut was a little surprising. Poehling scored just eight goals as a junior, and went 107 career college games without registering a hat trick. That’s not to say this is new territory for him. Poehling scored three goals in less than seven minutes during the preliminary rounds of the world junior championship back in December, helping the U.S. force overtime in a 5-4 loss to Sweden. He had two during his sophomore season at Lakeville North, against Benilde-St. Margaret’s and Lakeville South during the 2014-15 season. It’s a major pick-me-up for Poehling, whose Huskies, a No. 1 seed, were upset in the first round of the NCAA tournament by American International. Poehling is just one of a number of local players to make their pro debuts since the college hockey season began winding down last month. And they could soon have company. Minnesota Duluth is headed to the Frozen Four for the third straight season, but has a number of NHL prospects on the roster including, sophomore defenseman Scott Perunovich and junior forward Riley Tufte, both first-round picks. Check out a few other notable debuts and departures below. — Huskies senior defenseman Jon Lizotte made his pro debut Sunday for the Wilkes-Barre/Scranton Penguins, the AHL affiliate of the Pittsburgh Penguins, and scored his first goal. — Sophomore forward Blake Lizotte made his pro debut Saturday after signing with the Los Angeles Kings. — Blake Lizotte lined up opposite former teammate Jimmy Schuldt. A coveted undrafted free agent, the Huskies senior defenseman signed with the Vegas Golden Knights last week. Schuldt registered his first NHL point in that game, an assist. — A pair of Gophers juniors signed pro contracts last month. Rem Pitlick, the Gophers’ scoring leader in each of the past two seasons, signed with Nashville. Goaltender Mat Robson signed with Minnesota. — Gophers senior defenseman Jack Sadek signed with an amateur tryout contract with the AHL’s Iowa Wild last month. Sadek was a seventh-round pick of Minnesota in 2015. — The Wild still have one prospect playing in college hockey this season: Providence forward Brandon Duhaime, whose Friars face Minnesota Duluth in the Frozen Four semifinals this weekend. Duhaime was a fourth-round pick in 2016.